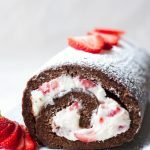 A Strawberry Chocolate Cake Roll is a beautiful and decadent dessert, and definitely one of my favorites! This one is made with a light chocolate layer and filled with cream cheese and fresh strawberries. Easy and simple! Chocolate and fresh strawberries together are amazing. Definitely one of my favorite flavor combinations. 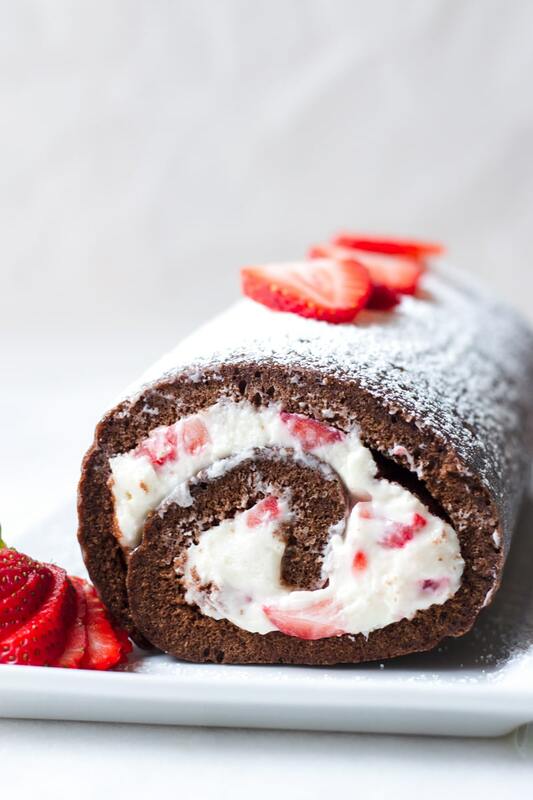 This chocolate cake roll, also known as chocolate Swiss roll, is amazing! The chocolate cake is spongy, and the filling is light from the whipped cream cheese, and fresh from the diced strawberries. Plus, it’s so pretty! 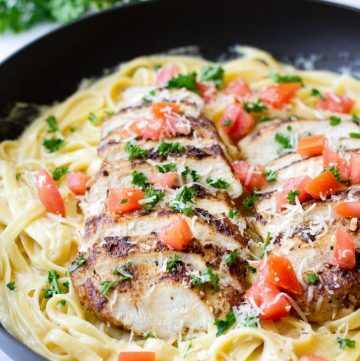 Definitely a great way to impress your guests. Or even yourself. 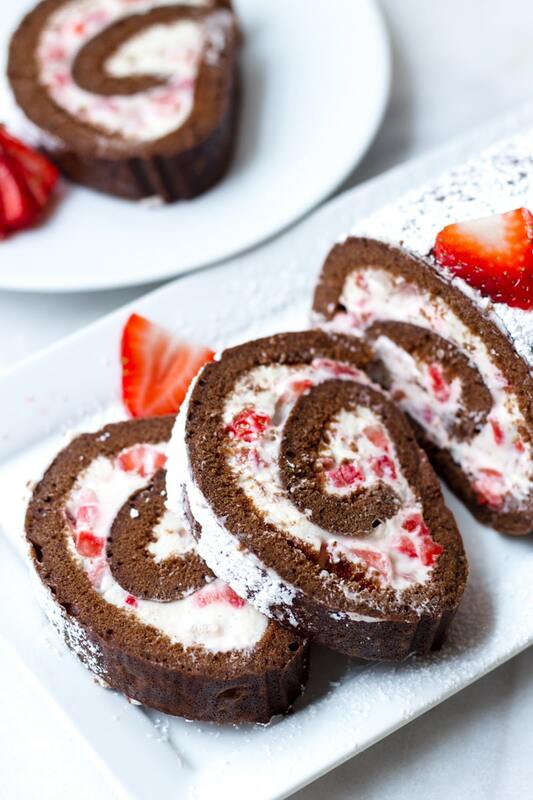 Below I share all there is to know to make the best strawberry chocolate cake roll ever! Combine the dry ingredients: cocoa powder, flour and salt. Set aside. 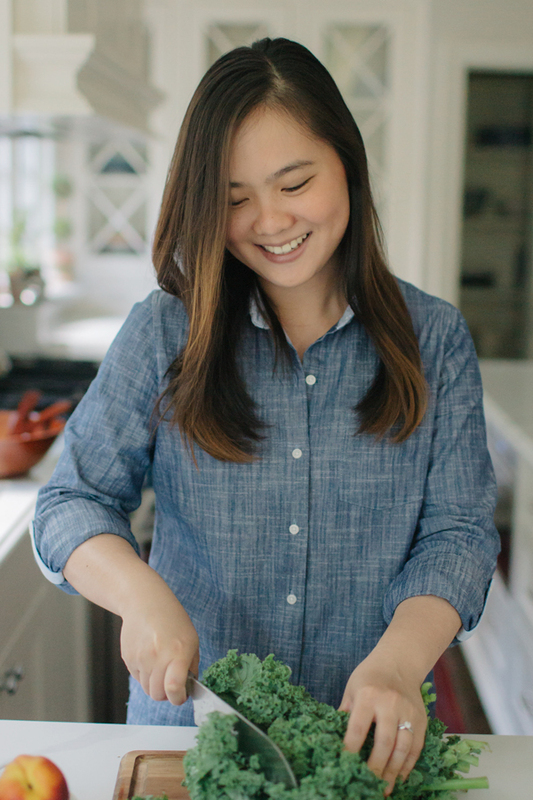 Create double boiler: simmer some water in a medium saucepan and place a heat-proof bowl on top. A pyrex bowl would be perfect. Add eggs and granulated sugar in bowl and whisk until sugar has melted and it’s warm to touch. Add vanilla extract. Why? This helps dissolve the sugar granules gently and smoothy without cooking the eggs. Then, using an electric mixer, beat on high speed for 5 to 6 minutes until light and fluffy. Why? This is an important step! We don’t want the cake to rise too much, which is why we’re not adding baking powder, but we still want a light and spongy texture. 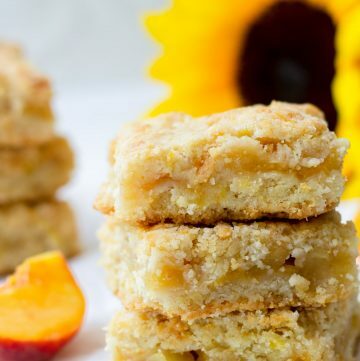 Pour batter onto a sheet pan lined with parchment paper. Why? 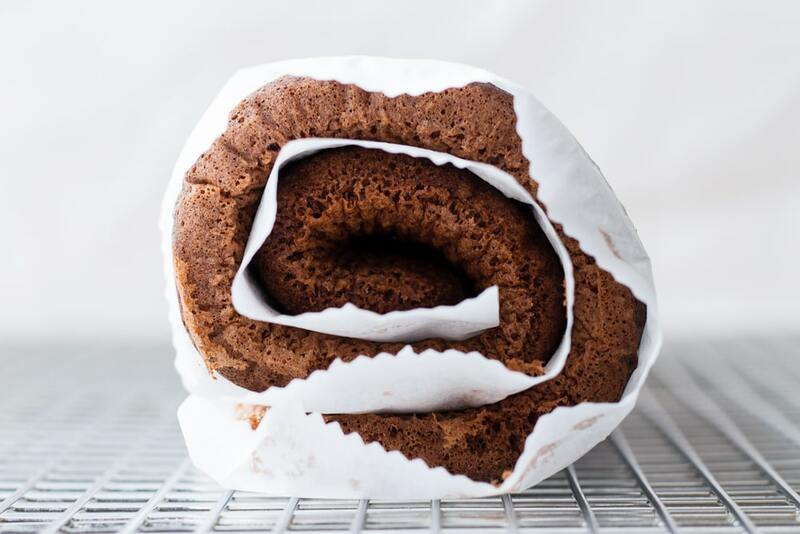 When you roll it out, the parchment paper will help tremendously. Bake at 400 degrees F for 8 to 10 minutes. While still hot, roll it like the picture below and let it cool down completely. Why? This helps the cake to “remember” this shape. Cake memory ya’ll. Using an electric mixer, beat softened cream cheese, softened unsalted butter, maple syrup, and powdered sugar. Gently fold in strawberries to cream cheese mixture. Unroll the cake once cooled, and spread filling, leaving a 1/2 inch border. Why? You don’t want a big mess. Roll back, peeling the parchment paper away. Wrap cake with plastic wrap and chill in the refrigerator for at least 1 hour. After the cake has chilled, simple cut off the ends so the inside is nicely visible. Then dust with confectioner’s sugar and sliced strawberries. I chose to simply dust it with powdered sugar and top it with some strawberry slices. But, you can definitely do a chocolate ganache, more cream cheese filling (omit the strawberries), icing, or whipped cream. 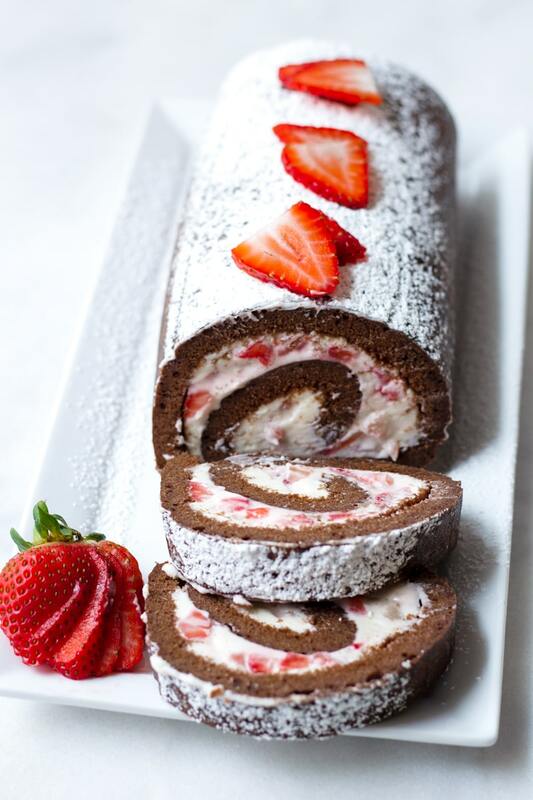 I had so much fun making this strawberry chocolate cake roll! All it takes is a little bit of patience as the cake cools down and chills. This chocolate cake roll is so easy to make too! 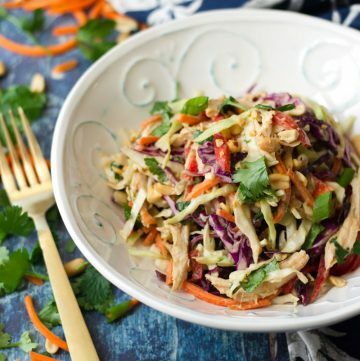 Wrap it with plastic wrap and store in the fridge for up to 5 days. Or freeze it for up to 1 month. If freezing, wrap with plastic wrap first and then with aluminum foil to avoid freezer burn. 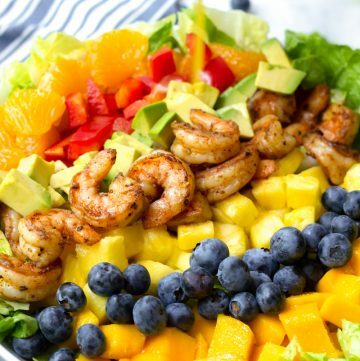 Serve it for dessert or for an afternoon stack with a glass of iced tea. Make sure you beat the egg mixture well. I’d recommend an electric mixer for best results. Use fresh strawberries! Frozen strawberries are darker in color and can become soggy after they defrost. For the cake layer, be sure to line the baking sheet with parchment paper. It will make rolling a lot easier. Definitely do not overfill with cream cheese. Use the amount in the recipe for a 9×13 cake layer. 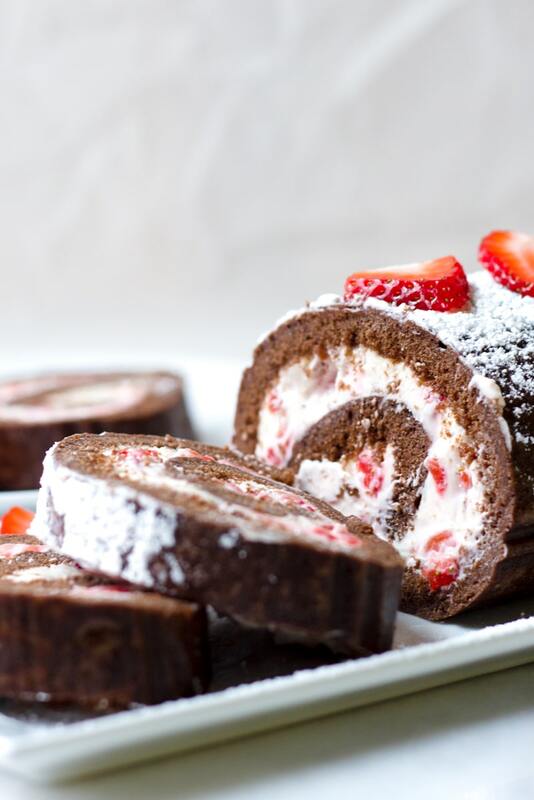 This Strawberry Chocolate Roll Cake is perfect for any occasion! A light layer of chocolate cake plus a delightful strawberry cream cheese filling. Coat a 10x15 inch rimmed baking sheet or jelly roll pan with some butter or cooking spray (just enough for parchment paper to stick) and line with parchment paper. This batter makes enough for the right thickness using a 10x15 inch pan. On a large bowl, mix flour, cocoa powder, and salt until evenly combined. Set aside. In a medium saucepan, bring some water to simmer (about 1 inch). 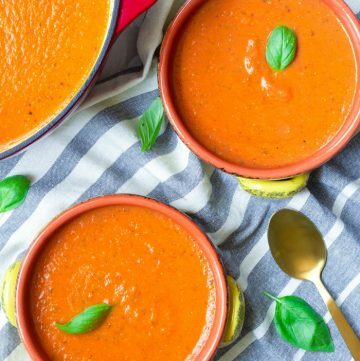 In a separate large bowl, add eggs and granulated sugar, and place it on top of the saucepan with simmering water, making sure to not let water touch the egg and sugar mixture. Whisk until sugar has dissolved and mixture is evenly combined and warm to the touch. Remove from heat. Add vanilla extract. Using an electric mixer, beat at high speed for about 5-6 minutes, until some volume is gained and the mixture looks a bit fluffy. Gradually fold in the dry ingredients mixture using a rubber spatula, until just combined and uniform in color. Add melted and cooled butter (make sure it’s cooled; how butter will deflate the batter) and fold in a few more times to combine. 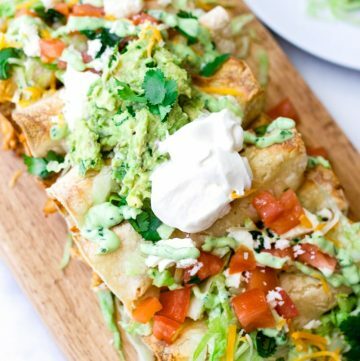 Pour batter on prepared sheet pan. Spread forming an even thin layer. Bake for about 8-10 minutes, until a toothpick inserted comes out clean and it springs back to the touch. Carefully, remove cake from pan, leaving parchment paper on. Roll, starting from the short end, and let it stand on a wire rack until cooled, about 1 hour. Once cooled, unroll it and until it is almost flat again. Make the filling: using an electric mixer, beat the cream cheese, powdered sugar, butter, and maple syrup until light and fluffy. 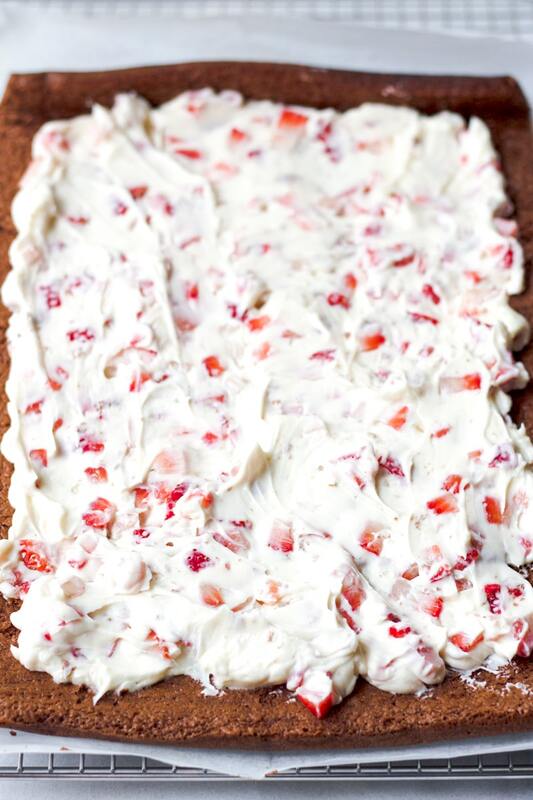 Using a rubber spatula, gently fold in the diced strawberries. Spread filling over cooled cake evenly, leaving about 1/2 inch on the border. Carefully, roll the cake, starting from the short end. Peel away or remove the parchment paper as you roll. Once rolled, wrap the cake with plastic wrap and chill in refrigerator for about 1 hour. Once chilled, unwrap the roll. Cut ends with a sharp knife. Dust with confectioner's sugar and top with strawberries.